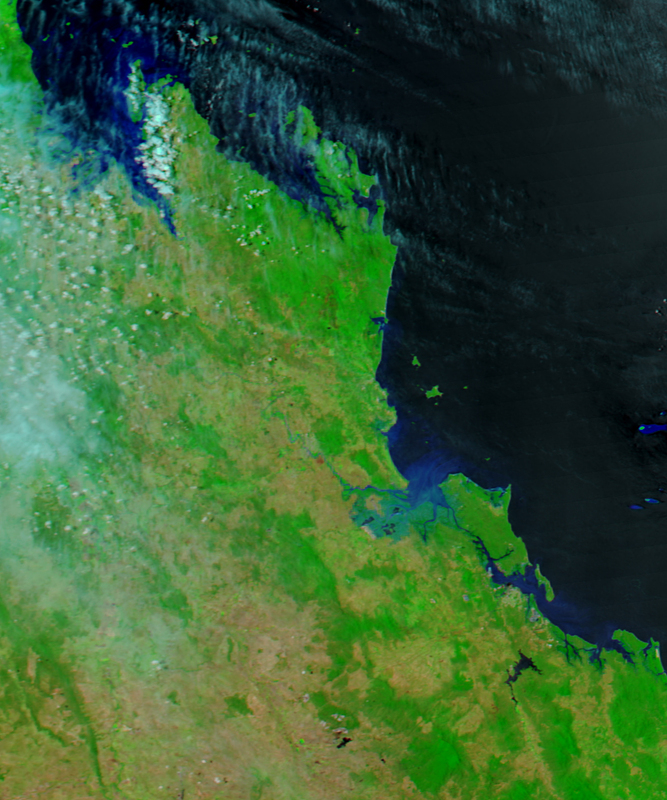 In March 2017, Cyclone Debbie struck the coast of Queensland, Australia, and dumped large amounts of rain throughout the state. 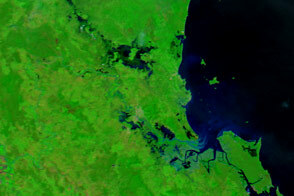 Several days later, flood water was still working its way through the state’s waterways and toward the Coral Sea. 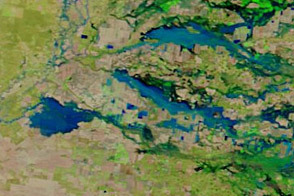 When the Moderate Resolution Imaging Spectroradiometer (MODIS) on NASA’s Aqua satellite captured this image on March 31, 2017, waterways were swollen in the Fitzroy Basin. 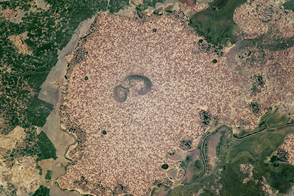 The second image, acquired on February 11, 2017, shows the region before the storm passed through. 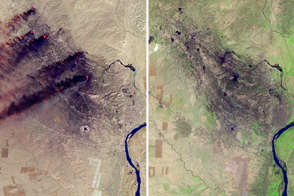 Both images were made with visible and infrared light (MODIS bands 7-2-1) in a combination that highlights the presence of water on the ground. 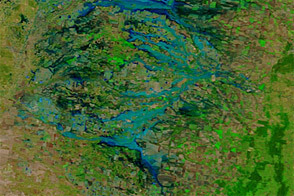 Water is generally dark blue or black in this type of image, but the rivers here appear light blue because they carry large amounts of suspended sediment. 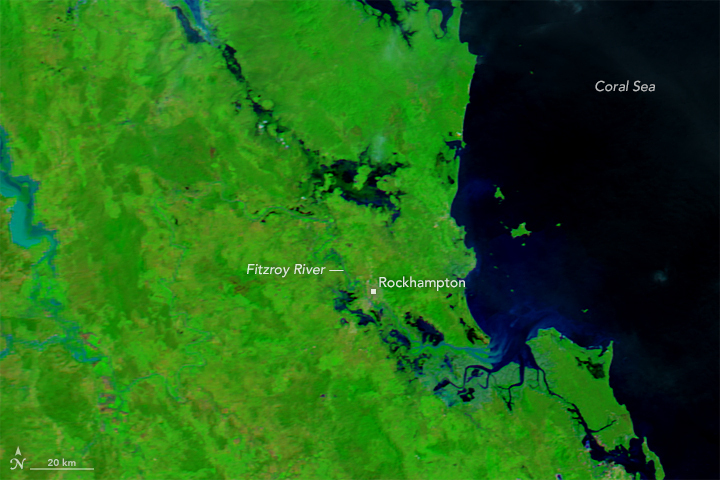 On April 3, 2017, the low-lying city of Rockhampton, which spans the Fitzroy River, braced for damaging floods. Australia’s Bureau of Meteorology forecasts that flood waters on the Fitzroy will likely crest at 9 meters (30 feet) on Wednesday, just short of the peak floods that affected the city in 2011. 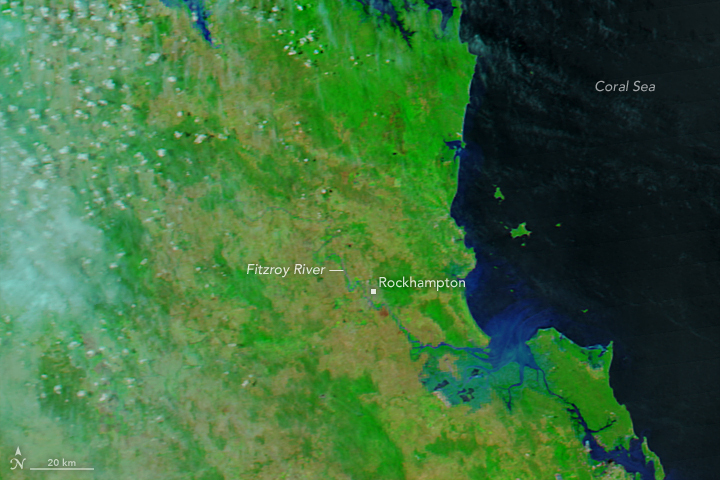 While water had not yet inundated Rockhampton when the image was acquired, a large volume of flood water was visible upstream (on the left side of the image). Also, flood water had pooled in several low areas to the north, west, and south of the city. Turn on the image comparison tool for a better look. The cyclone displaced tens of thousands of people from their homes in Queensland and New South Wales, cut power to at least 100,000 people, and contributed to at least two deaths, according to news reports. The city of Rockhampton is bracing for major flooding. 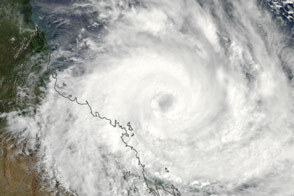 Cyclone Debbie swirled in the Coral Sea in March 2017 before coming ashore near Townsville, Queensland. Bureau of Meteorology (2017, April 3) Flood Warning for the Fitzroy River. Accessed April 3, 2017. 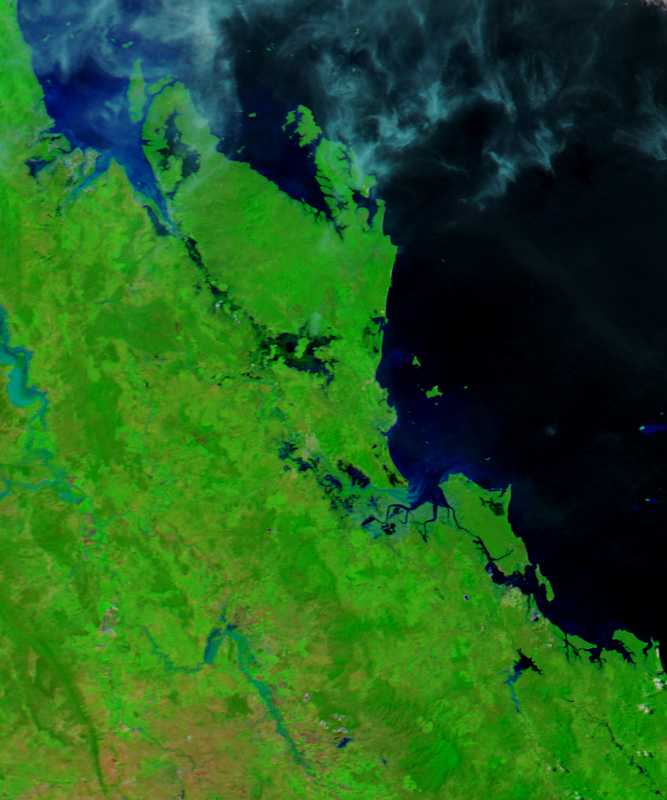 Huffington Post Australia (2017, April 3) Why Rockhampton Is About To Flood, Despite No Rain For Days. Accessed April 3, 2017. 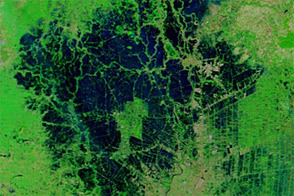 NASA Earth Observatory (2011, January 6) Flooding in Queensland. Accessed April 3, 2017. The Morning Bulletin (2017, April 3) Fitzroy to reach 9m peak by Wednesday. Accessed April 3, 2017. Time (2017, March 30) Rising Flood Waters Displace Tens of Thousands in Australia. Accessed April 3, 2017.